If you upload a photo from the trail you get 15 points, you can give a virtual Jeep wave for 5, or comment on a thread for 5 points. You also get 10 points for each day you log into the system. But the real points come rolling in when you check in at a trail for some Jeeping with a whopping 200 points per check in. My profile in Jeep’s BoH program. Why doesn’t it show a Wrangler – the vehicle I own? And unfortunately that is where Badge of Honor really falls apart. The app (which is available for Android and iOS) allows you to check in on certain trails in the BoH program. Now, most off-road trails are not within cellular data range so the app designers allow you to check in, then “upload” the check in once you return to civilization. The cool part? 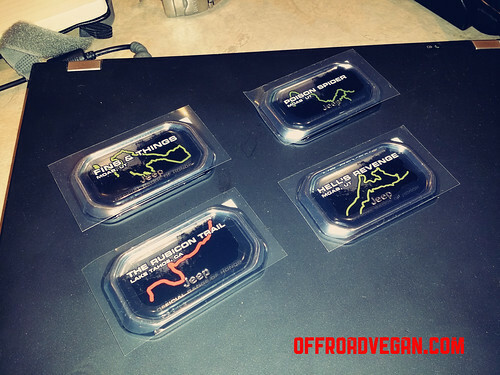 Jeep will send you some really nice, well made full color hard badges for each of the trails you run. The bad part? It never works. I have even tried it on multiple devices. Every time I use the app, this is the error. So, basically I can never check into a trail. Which is really the crux of this program. Now I know this is a free program, so I should appreciate what Jeep is trying to accomplish. And I really do. But with a concept like this comes a great amount of responsibility, especially with a passionate brand following like Jeepers. If you give us a program to log into trails, collect points, have virtual jeep waves, and get cool badges…well make it work. A loading indicator is all I see sometimes. To get badges for the trails I ran, I had to call Jeep’s customer service number. Most people that answer the phone aren’t even aware of the Badge of Honor program and it is up to you to educate them on it (even though the same number is on the BoH site for help). Once educated, they will issue a case number for you and send you a link in your email where you can upload “proof” that you did the trails. So I am relatively OK with this and appreciate the work around, but how about just making it work!? For the last few missing badges, they said they would email me the link, and it never arrived. Never. You may never get the link to upload proof. But you will receive countless requests to complete surveys. I ran my first trail – the Rubicon – on Labor Day weekend 2013. I had a successful check in as there was a data connection at the trailhead. My badge arrived in the Spring of 2014. And it took me about 10 calls to customer service and back to get it squared away, and I still do not have all the badges for trails I have since run. If you work REALLY hard and spend a lot of time on the phone with Chrysler, you too can get some badges. 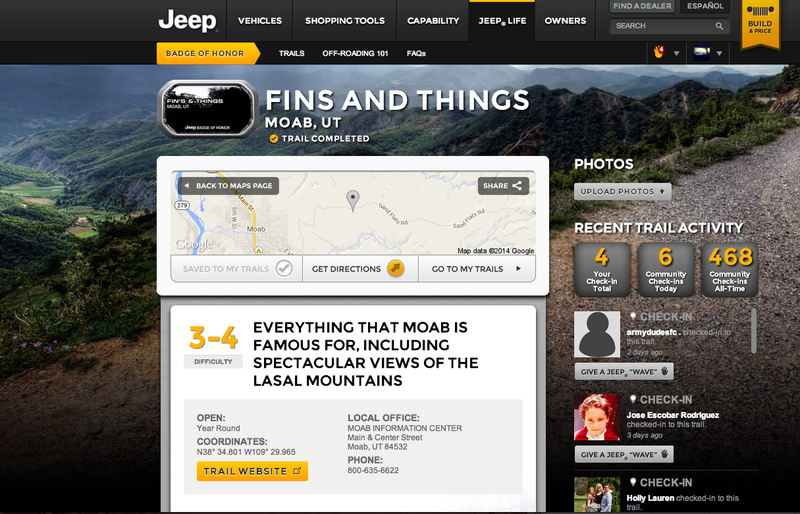 Jeep needs to fix the mobile application to allow users the ability to reliably check in when on the trails. Another frustration among many Jeepers is that the trails recognized by the program are determined and chosen by Jeep – there are no community sourced trails. This leaves a lot of people (mostly on the East Coast) without representation and the ability to participate. The trail data is actually really cool and well done. It just doesn’t work. If Jeep is committed to making Badge of Honor work, they only need to make some very simple changes and it would be an amazing asset to the Jeep crowd. But the stench of corporate bureaucracy is strong with this one. It is a half-baked attempt. For now, I will stay away. Previous PostRestaurant Review: Root [Boston]Next PostOff to Jeep Beach! I’m the new manager of the BOH program. I’m sorry you’ve had trouble, and I know the process needs a lot of improvement. I see on the records that you’ve had at least three badges that you had to call in to receive, and I know that’s frustrating. I hope you’ll be glad to hear that we have a lot of big changes coming in the next few months. The issues have gotten out of hand, and what was supposed to be a fun way to promote the brand has become a frustration for many Jeep owners. Clearly, that’s not ok with us, but it’s not an overnight fix either. Fixing the app issues is a high priority, and I’m also working on a better way for users to contact us without going through a representative who doesn’t know much about the program. As for user-defined trails, that’s definitely a great idea, and we would love to implement it. We just want to make sure we don’t run into legal issues concerning private property. However, we are definitely interested in adding more trails, especially in areas that don’t currently have BOH trails, and it’s very helpful to see feedback online about trails that users enjoy, and features that would make the program better. I hope you’ll continue to participate in the program, and I appreciate this feedback. It’s more helpful than you know! Have a good one. I submitted for two badges the first week of May and still nothing?? I live in Brazil and am a proud Trailhawk owner. Will the Badge of Honor program be expanded to include other countries outside the USA? I see someone from Australia asked the same question, but I did not see a response. Jake would you please contact me I have a different issue with Three badges I could use some guidance and assistance with please sir. I have to second the comments in the writeup. I really liked the idea of the program and was excited by the idea of adding badges to show what my Wrangler and I had accomplished. But after numerous frustrations with the App and the Customer Service calls I gave up last spring. Hopefully Jake can get a better program off the ground but it’ll take some serious improvements before I spend my time with it again. 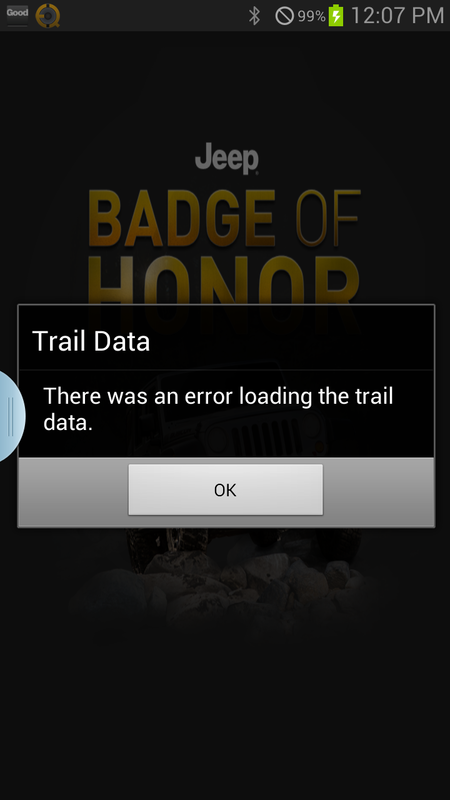 I’d rather spend my time on trails instead of messing with another app and/or waiting 12 months for badges to ship out. So with this program, what happens if you need a wheel bearing replaced under manufacturer warranty? Can’t Chrysler look you up in their database by VIN and deny the claim due to offroad use? Isn’t this a way for Chrysler to track you to deny any warranty repairs? Klem – I am pretty sure Chrysler can’t deny your claims due to going off road in a “trail rated” 4×4 vehicle. I don’t know of any court in the US that would stand for that. Also, about the warranty concern… I can’t speak for what the dealerships will or will not accept under warranty, but I can tell you that they do not have access to Badge of Honor records. To my knowledge, they determine off-road usage by inspection only. So if you did a scenic and easy trail and didn’t get any damage, they’d never know. Not sure how they’d respond if they saw the badge on your vehicle though… And in my opinion, that’s very annoying because we want our users to proudly display their badges, but we also don’t want them getting frustrated that their warranty claim was rejected because of it. The new app is now available on the App Store! Soon to be available on Google Play. Check it out. It’s so much better. Great! Please keep us posted on Android. Check it out!! It’s so awesome! And keep in mind, this is just the first update. We have a lot more content planned for the future, taken from user feedback. This one was just to fix the bugs, mostly. Plus a way cooler interface. So far it looks amazing! Impressive. Cool! Please send us any feedback you may have from using the new app – again, the email is BadgeofHonor@jeep.com. This app SHOULD fix the check in issues since it no longer relies on cell service. So the next step is adding cool new features. My favorite, as you mentioned in this article, is community sources trails. I’m not sure yet the best way to execute it, but we would love to do it! Thanks again for your feedback, Scott. I went to Jeep Safari and downloaded the app. Never once did the app even let me login. I downloaded the iOS version. I’ve emailed the badge customer service to see what if anything you can do with getting badges now that I am not near Moab any more. I have photos to prove I was there along with registering at the jeep kiosk to win a SUV and getting a jeep safari patch. I would have felt better never knowing about these badges if I would have known how impossible it is to get the app and prove you were there. Yes, I just saw your email. Thank you for the feedback. So far, the new app has worked much better for most users, but we have had a few isolated cases of problems like this one, so the feedback and knowing about the device used is very helpful. Also, it’s not a problem to send you badges manually. I replied to your email. All I’ll need is the name of the trails you did and a shipping address. Thanks Jake for the fast response! Do you know if there are any plans to expand the program outside of the US of A? There are a lot of loyal Jeepers down here in Australia that would be very keen to participate. Jake, I submitted for a couple of badges the first week of May and still nothing?? The system is definitely far from fixed. Over the past three months, I have yet to receive two out of three badges. All of which were submitted and documented in October. Based off previous comments, the creation of the badgeofhonor@jeep.com only made the “customer care” line lazier. They deflect all issues to that email address and will give zero support. Even after multiple escalations. They will drop the line, “we only deal with vehicle issues.” Apparently, this is customer service. 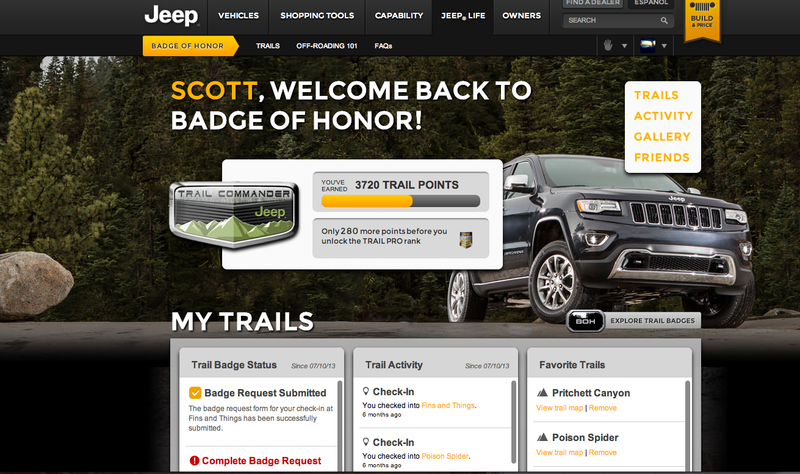 Six emails (one per week since badge one arrived) go unanswered at the badgeofhonor@jeep.com. Might be sheer volume but after a month any response would be appreciated. I am more displeased with the poor customer service provided than with not having the badges. I came across your blog and see it hits the hammer on the head. Going forward, I plan to educate people on what to expect from Jeep(FCA) customer service and will point people here for what to expect. Sorry to hear it is still not working out. I reached out to Jeep again this AM via email, letting them know about my readers’ recent issues and feedback. We’ll see if they come back here and post any updates. Thanks for stopping by. Nothing has changed since you first published this blog. A trip to Drummond Island took an act of God for the group to get their badges. 7 months, 4 phone calls and 15 emails after visiting Redbird SRA I’ve been told: “this is a very tedious process”. Really? At this point my persistance is not as much about the badge as the poor customer service. This is a great program they should either get right or kill. On another note …..there is a site called “conqueredtrailz.com”. Here you can buy your own badges of completed trails.,,,they don’t care if you did them ir not….lol….and the custom design I’d there is a trail in your area they don’t have…..I’m liking this better. Just spent 10 days in Ouray, CO & hit all the trails out there I could. 3 trails let me check in & it showed I earned them, the other ones did not. (Black Bear didn’t!!!!) I would appreciate a reply to my email I’ve sent so I can get this squared away. Thank you. Completed South Marble Head trail in Drummond Island Michigan on April 23, 2016, was told it would take 8 to 12 weeks and have yet to receive badge!!! Have emailed badge of honor and jeep jamboree! Jeep jamboree responded immediately and forwarded my email to badge of honor!! Have yet to receive anything from badge of honor!! Well jeep has failed again, now not only does there customer support not have information but now are unable to get you to them. Can someone explain to me how you can work for Chrysler/jeep yet no one has your phone number? I emailed the badge of honor program SIX weeks ago without a response, not a email saying we are extremely busy right now do to our app failing, badges are back ordered right now, or we have received your email and will respond as soon as possible. Don’t get me wrong this is a free program from Jeep and that’s awesome but if your going to do something do it right and have the correct number of people to fix it when it doesn’t. I did one of the trails on June 8th and as of Sept 1st I hadn’t recieved the badge. About a week later I received an email that they were having email issues and were way behind answering them and sending out badges. The manager said mine was in the next batch to go out. I finally received it but it was the wrong badge. they sent me the one for Imogene Pass in CO. It should have been Schnebly Hill in AZ. I sent an email an received a very prompt response that they made a mistake on many that were mailed out and that they would send me the correct one. It’s not Oct. 20th and nothing yet. It’s ok, I’ll wait. I understand they’re going through a lot of issues but at some point you fix them right? We did the south marblehead loop on drummond island in michigan mud october of 2016 and the app is still complete garbage…with no regrets to the trails, we chose this as our fall vacation as we thought ut would be cool to get a badge from a trail in michigan as a michigan resident….sadly the app would crash every time. Im disappointed i cant put a badge on my rig, but id do it all over again as the trails and scenery on the island are amazing! I am the manager for the Badge of Honor Program from Jeep. I apologize for an issue you are having with the App and the Program in general. The number of users significantly increased over the year and has taxed the system. We are currently working to address the issues this has caused. If you have any feedback regarding the App, we would appreciate it! We can be reached at BadgeofHonor@jeep.com. Also, if you have any trouble with the App while you are out on the trail, let us know when you are safely back and we will do are best to address your concerns. I am having issues with checking in on trails. It says error checking in, and will upload at a later time. ???? You might as well give up on using this program from Jeep. I have two trails I did in March at the Easter Jeep Safari and they never even bother to return my emails attempting to get more information. They have some nice badges you can put on your rig. And can make badges for trails they don’t have in their website.